We are here to announce a Tour by SAUDIA Virtual Airline titled Cities Connection Tour with a flying partner Emirates Virtual Airline. 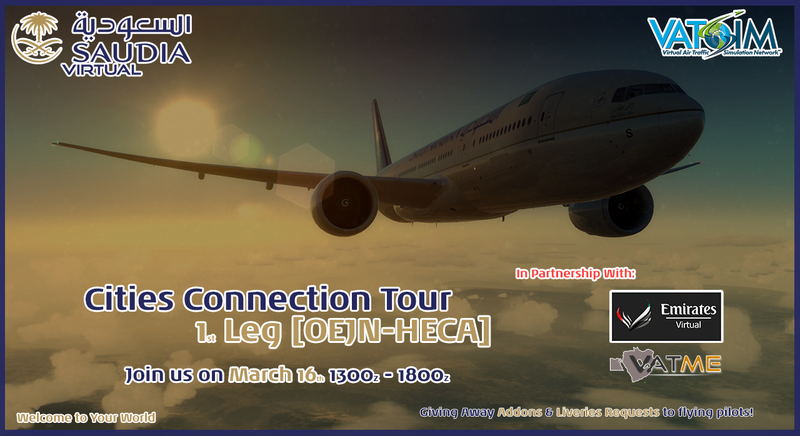 A tour that consists of six legs, Our first leg is OEJN-HECA, FULL ATC COVERAGE CONFIRMED ALL OVER THE TOUR. 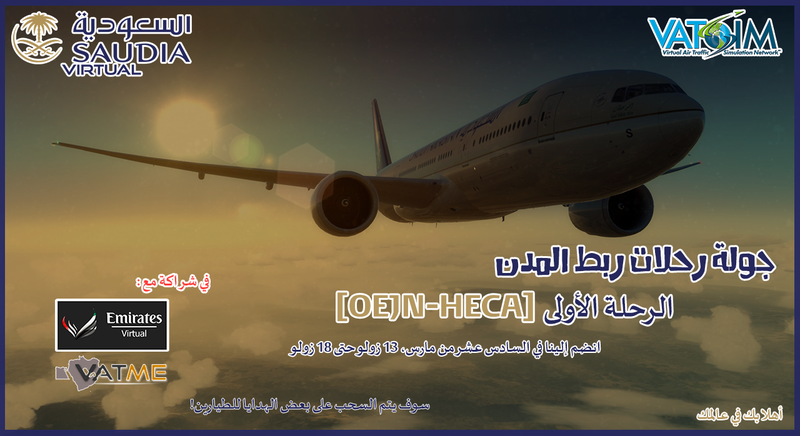 What you have to do if you are flying on SAUDIA Virtual Airline on OEJN/HECA 1st Leg, Book Your Slot as SVA01 till Any Number also we will give away some add-ons for pilots who complete all tour legs! This is the promise of Winter at Tantora, the first event of its kind held in Al-Ula County. Surrounded by breath-taking natural beauty and magnificent monuments to human endeavour that span millennia, Al-Ula is one of the worldâ€™s greatest undiscovered wonders. 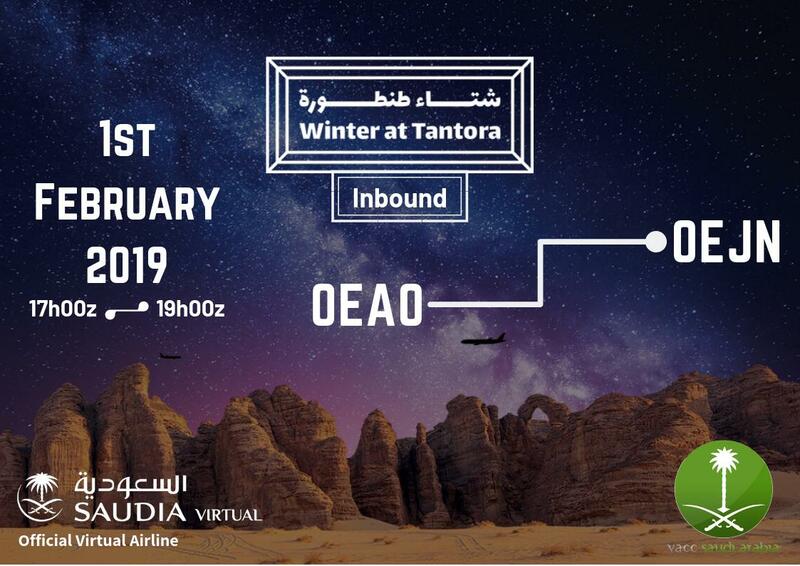 SAUDIA VA being the official airline of this festival, fly out the last few visitors from Jeddah | OEJN to the historical land of Al-Ula | OEAO. Fly out of Jeddah on time at or after 17h00z for an hour flight to arrive at Al-Ula by 19h00z. Expect ATC at both the airports during the 2 hour window! Note: As the parking at Prince Abdul Majeed bin Abdulaziz Domestic Airport is limited it is requested to fly small to medium type aircrafts during the group flight, participants are also requested to stay no longer than 10mins at their designated parking spot once landed. In the case there are no available parking spots at OEAO, the participant can either ask for holding until a spot has been freed or may park at the other side of the runway on the grass / sand, so please pilots double your HOLD fuel amount for such cases. A group flight that connects between OMDB & OERK within a partnership between us & Emirates VA. Wish to see you all! Once again it's that time of the year, where millions of pilgrims set their foot on two of the holiest cities in the world, Makkah and Madinah. Therefore, Saudi Arabia vACC welcomes you to Jeddah and Madinah on the 10th of August 2018 | Friday to take part in this holy occasion to transport pilgrims from all around the world to Saudi Arabia. Arrive at Madinah or Jeddah between 16H00z to 20H00z and expect our ATC to guide you along the way into our featured airports. Hope to see you all there | Safe flight! Once again VATSIM Middle East presents The Annual Light Up The Middle East Event!rnrnAn event which allows VATSIMers to fly around the middle east in a promising professional environment where the main FIRs will be staffed with ATC along with local ATC in the important hubs in different countries such as King Abdulaziz International Airport in Jeddah, Saudi Arabia. Join us on the 28th of July and fly between 15H00z to 20H00z from and to your desired airports. Fly and mark your spot on the scope and make Light Up The Middle East like never before!